Only 4 slots are open this time! All orders will be shipped AFTER Christmas, I don't want anyone's sculpture lost in the mail... I work to hard on them for them to get lost! Quick reminder of the awesome holiday auction that ends on the 20th! 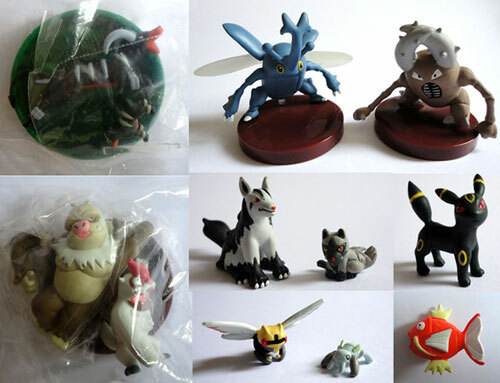 Get your bids in now on ornaments, Mystery Dungeon goodies including a puzzle and clearfolder for the latest game, magazines chock full of awesome promo swag and information, and the very rare Salamence line promo TCG package with included magazine! Also, does anyone here collect manga? I have two full shelves just of Pokemon (and Special alone is threatening to force another expansion!) including the original 4 koma, movie adaptations from magazines, and other rare books. Though my favorite is the 8 books that make up Diamond and Pearl Adventure!, which is a fantastic and tragically underrated series (go read it, both Viz and CY translated it, you have no excuse). So, who else collects Pokemanga and what are your favorites? Claims are $7.50 per plush BEFORE shipping to me, fees, and shipping to you. I ship from the US granted sales permission by denkimouse January 12th 2010, feedback is located here. I'm looking for them for about $22 before shipping! Thanks! (Please note I am leaving for vacation this friday (21 Dec) and won't be back until the 30th. All items will be shipped after the new year! A little preview of what I have to offer! :) In the words of Scar...BE PREPAAAAAAAAAAAAAAAAAAAAAAAARED!!! mwahahahah! I hope its okay to do another one of these. 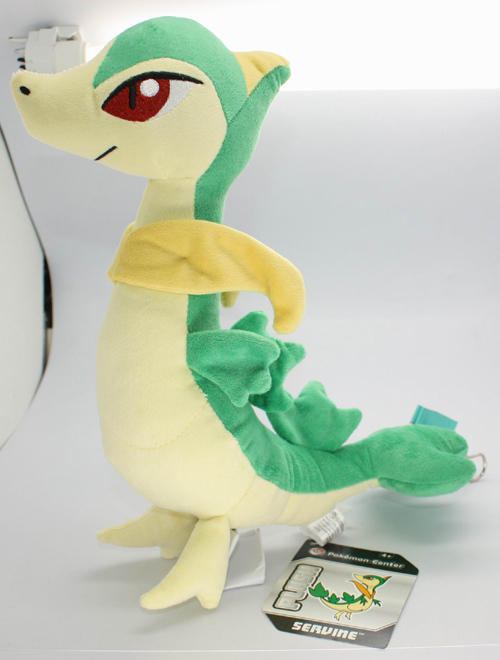 Price per plush: $7.50, this price does not include any fees or shipping to me/you. 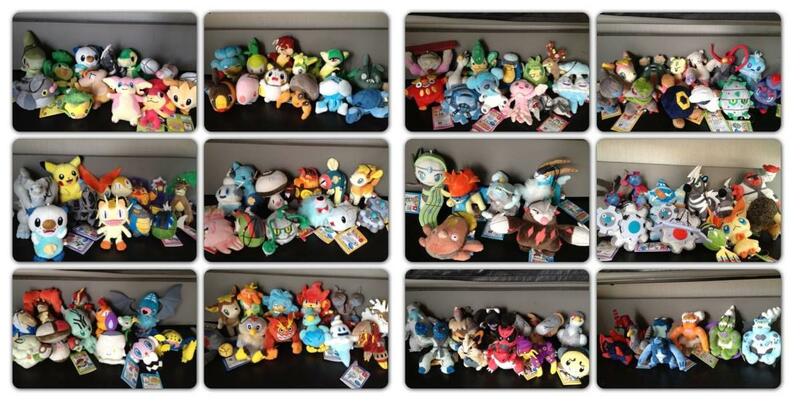 There's just under 5 hours left, and still over 30 plush without bids! 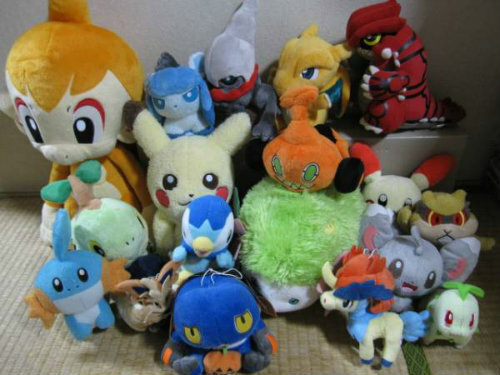 Did you know, if every unclaimed plush gets a bid, there's the possibility of discounts? Hi! Up for sale some great zukans. All figures are MIP or in great condition,check description and the pictures for details under the cut. Finally, a question: how much does the Wailord zukan weight?? 500gr maybe? 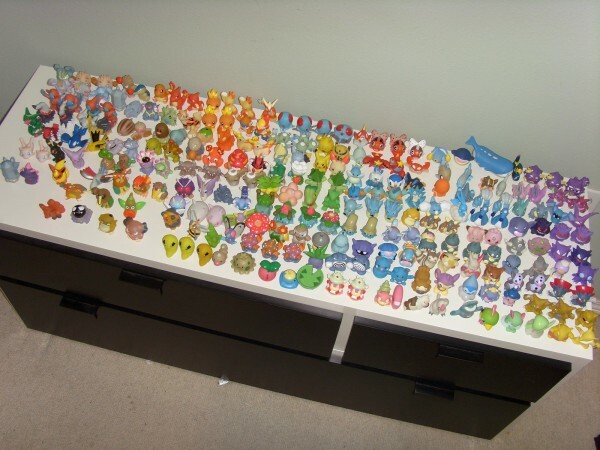 Well, I've avoided it up until now… I've decided I want to start collecting an Eeveelution. Which one you ask? Tada~ I Choose Glaceon! 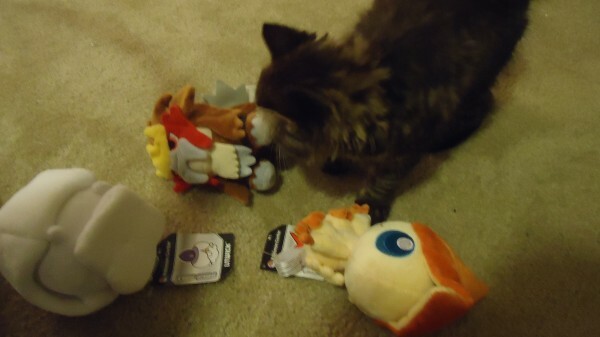 Why Glaceon? Because I've always liked the design… the 'bangs' are absolutely awesome. I always thought of Glaceon as a fashionista with the 'bangs' and the ear tails on either side of her face. - Figures, Kids, and keychains $? 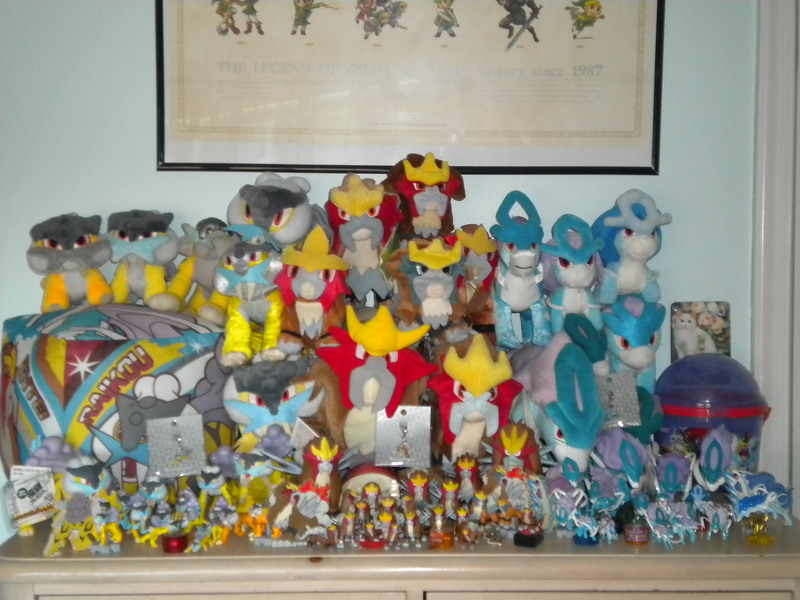 Now, I know there is lots of merch for Glaceon and I realize some of this might be out of my price range for now but I'm looking on slowly building this collection up. If it's not on my list, throw it at me and see if I bite. I'm only looking for Glaceon specific items, too. I also know there are various sites I can go visit to buy some of these items but I like to check the community sales and such. And of course, show off your collections~ I'm still learning the merchandise anyway so would love to see what's out there. Hello! I'm here to congratulate you for your bids for this audition, we won the stock! - The winners can trade feedback with entirelycliched as well after getting their items. Please comment once you send your payment so she can respond with your final shipping! See you around and Merry Xmas! hey everyone, I want to bring you a GB of the latest MPC set, containing zoroark, cincinno, solosis, bisharp, whirlipede and haxorus. 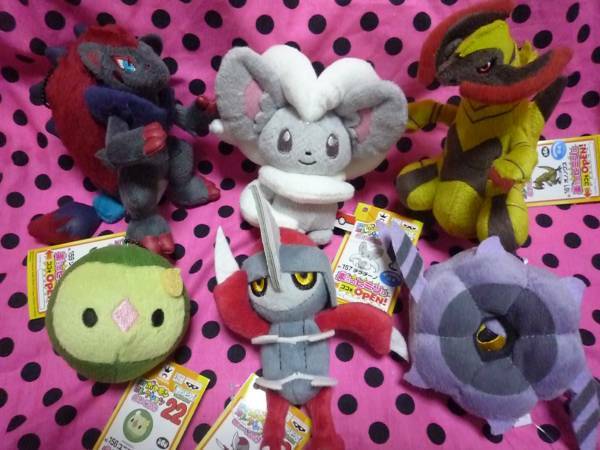 each plush will be $8.35 before fees + shipping. this is on Y!J and there will be two payments 1. for the items + fees and shipping to middleman 2. shipping to me + shipping to you. found this lot on ebay just now..
secondly, is it possible for me to help in a GA without actual sales permission? i read the rules but i couldn't quite figure it out..
and its been a few weeks...so im kinda stuck on what to do ?? new years mini dolls + remote control 'here and there' toys! I have two pickup lists to begin today! Nice and simple. Sets cannot be split up (by me)! Feel free to take claims on your own LJ's or on the community before putting your name down for a set. Reselling your unwanted dolls later is 100% legit and allowed and will not be frowned upon. Comment in the appropriate thread below to get on the wait list! Each toy is about 10-15 cm tall and moves around in fun ways like this. Comment in the appropriate thread below to claim whichever remote control toy you want! My pickup policies and feedback can all be found here. I got a package from Sunyshore this morning, and I admit at first I had no idea what it could be cause the package was so small and I wasn't expecting anything small. I was really surprised to see that it was from Sunyshore because I never expected the shipping to be THAT fast. Multipurpose post - sales, collections, questions! Being a simple multi-purpose post, just wanted to let you all know that I have opened my store (through a lot of cleaning on spaces) to clear up some spaces and some items' arrival! First off, the small sales post! Click the banner to go there! 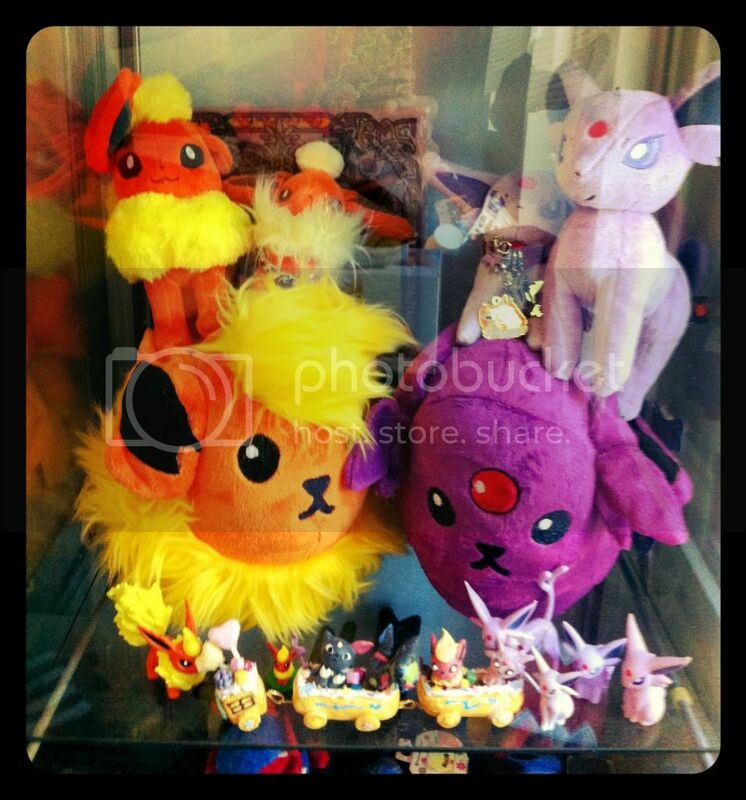 Lastly, do you think these Eeveelution plushies is able to clean up via washing machine by putting them into laundry bag and in mild setting, or how do you clean them (in a fast or simple manner)? Thanks on answering and viewing! well that's what i'm up to at least. i'm looking to fill my school-free weeks with some commissions, so i hope you guys are looking to fill some holes in your collections with some custom plush! 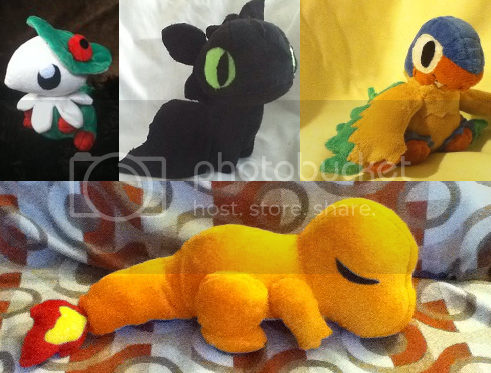 here's a link to the slots, and a link to more examples of my plush! And I have two flavors! First off, shipping will happen on either Thursday or Friday for all people who are waiting on things from me! I will go through as I package things tomorrow and notify people as their things are packaged and if I need shipping payments from them, so expect to hear from me soon! 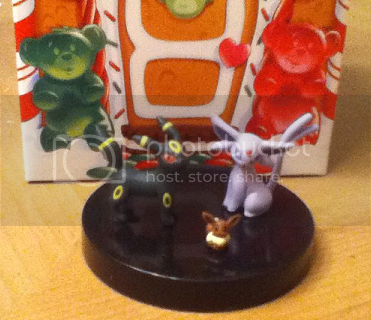 Secondly, the Umbreon/Espeon zukan offers will end tomorrow afternoon, so get those offers in now! Now for the commissions! I'm taking 12 slots this time and they'll be done by the end of January/first two days of february. I miscalculated how long it would take me to get adjusted after moving last time, but that is no longer an issue as I am settled and better than ever! This time, they come in two flavors. I prefer the full payment up front so I can buy all fabric, but you can discuss potential payment plans with me! I will keep in contact with you through this post and post status of commissions here as well. I'll keep everyone updated on status to the best of my ability! I can make anything, Pokemon, people, other fandoms, just let me know your needs! 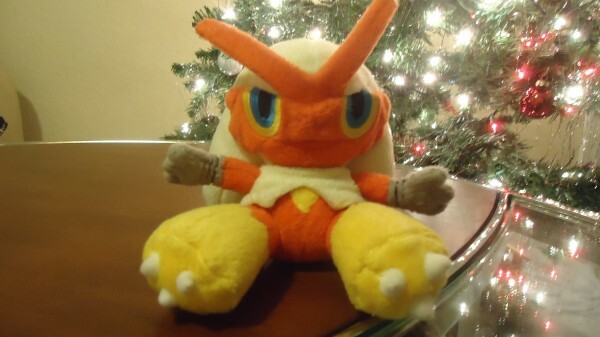 Alsooo, I'm selling my Blaziken pokedoll! -Sales permission granted by entirelycliched on May 6th. 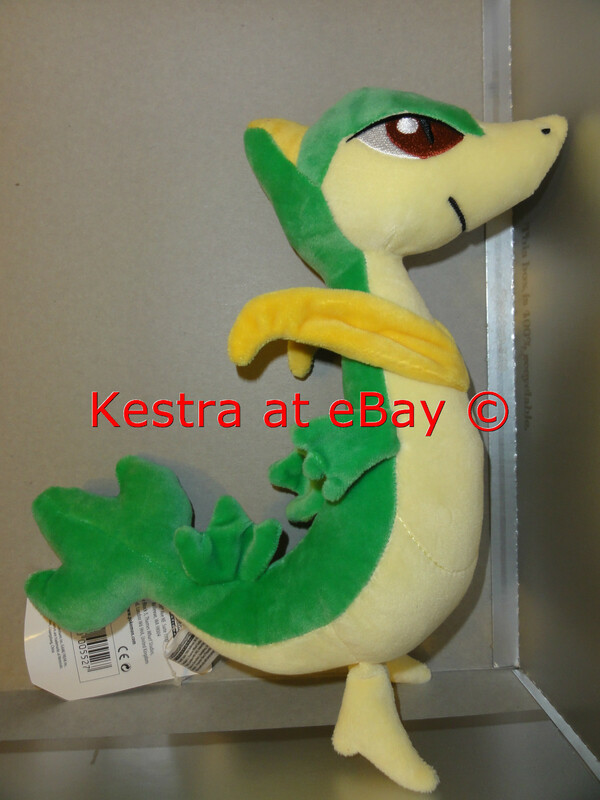 I was looking for prices of the Servine plush from Nintendo World on ebay and I came across two different versions of it. The first one has the correct tag but there's a space between the eyes and the green part of its head. While the other, which I've seen more often as an official image, doesn't have that space. I must mention that both users are from United States.